Personal information provided on the website and online credit card transactions are transmitted through a secure server using Secure Socket Layering (SSL) encryption technology. When the letters "http" in the URL change to "https," the "s"indicates you are in a secure area employing SSL; also, your browser may give you a pop-up message that you're about to enter a secure area. We are committed to handling your personal information with high standards of information security. We take appropriate physical, electronic and administrative steps to maintain the security and accuracy of personally-identifiable information we collect, including limiting the number of people who have physical access to our database servers, as well as employing electronic security systems and password protections that guard against unauthorized access. Our website uses encryption technology, such as Secure Sockets Layer (SSL), to protect your personal information during data transport. SSL encrypts ordering information such as your name, address and credit card number. Our customer service center and stores also operate over a private, secure network. Please note that email is not encrypted and is not considered to be a secure means of transmitting credit card information. Generally, you may browse the website without providing any personally-identifiable information. However, we may ask you to provide personally-identifiable information at various times and places on this website. In some cases, if you choose not to provide us with the requested information, you may not be able to access all of this website or participate in all of its features. 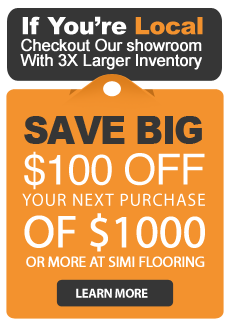 We receive and store any personally-identifiable information you enter on the website, whenever you shop with Simi Flooring -- online, through our catalogs, or in our stores -- or information you give us in any other way. For example, we may collect the following personally-identifiable information: your name, address, telephone number, driver's license number, birth date, and email address. If you use a credit or debit card or pay by check, we will also include your account number. When you register with us as an online customer, we may ask for additional information, such as your favorite products. When you visit this website, our Web servers automatically collect anonymous information such as log data and IP addresses. We may use the automatically-collected information for a number of purposes, such as improving our site design, product assortments, customer service, and special promotions. We will disclose some information to TRIXMEDIA, the provider of our shopping cart and ecommerce platform, Goozga. Simi Flooring: All of the above information that we collect, as described above, may be shared among all Simi Flooring's entities. Service providers: We also may disclose information to outside companies that help us bring you the products and services we offer. For example, we may work with an outside company to: (a) manage a database of customer information; (b) assist us in distributing emails; (c) assist us with direct marketing and data collection; (d) provide us storage and analysis; (d) provide fraud prevention; and (e) other services designed to assist us in maximizing our business potential. We require that these outside companies agree to keep confidential all information we share with them and to use the information only to perform their obligations in the agreements. Compliance with the Law: We may provide access to information when legally required to do so, to cooperate with police investigations or other legal proceedings, to protect against misuse or unauthorized use of our website, to limit our legal liability and protect our rights or to protect the rights, property or safety of visitors of this website or the public. We provide you with a number of choices regarding our handling of your nonpublic personally-identifiable information. Direct Mail or Telephone Marketing: If you shop at Simi Flooring and wish to be removed from the list of customers that receive direct mail or telemarketing please contact us. Because customer lists often are prepared well in advance of an offering (sometimes several months before the offer is made), you may continue to receive some offers after you send us a request not to use your information for specified marketing purposes. We appreciate your patience and understanding in giving us time to carry out your request. Simi Flooring partners with advertising companies to place our advertising on publisher websites on the Internet. These advertising companies collect anonymous information about your visits to our website by the use of tracking cookies or other techniques. Protecting children's privacy is important to us. Our website is a general audience site. We do not collect or maintain information from those we actually know are under 13, and no part of our website is targeted to attract anyone under 13. We also do not send email correspondence to anyone who tells us that they are under the age of 13 without their parent's consent. Our online sweepstakes are restricted to entrants who are at least 18 years old. While visiting SimiFlooring.com, you may encounter links to websites operated by our business partners or other third parties. This does not mean that we endorse these websites. We do not make any representations or warranties about any website you may access through this website. They are independent from us, and we have no control over, or responsibility for, their information or activities. To make online shopping faster and easier at this website, you may register. As a registered customer, you only have to enter your shipping addresses and billing information once; they will be securely stored with us for your future use. Using your name and a password of your choice, you may access your account online at any time to add, delete, or change information. If you are using a public computer, we strongly encourage you to logout at the conclusion of your session. Your information will still be stored with us but it will not be accessible to anyone else from that computer. You will receive promotional emails from us only if you asked to receive them. If you do not want to receive email from this store or its affiliates, you can click on the unsubscribe link at the bottom of any email communication sent by us. Please allow us three business days from when the request was received to complete the removal, as some of our promotions may already have been in process before you submitted your request. We’re happy to provide additional information. Please contact us.